When you go to a restaurant and order your meal, it’s customary to order your entrée first, your main course second and dessert comes last. And when that stick date pudding (drizzled in butterscotch sauce) arrives, you enjoy it, knowing that you’ve earned it. Life isn’t that different, but sometimes we forget this important principle. Too often we look for the dessert, forgetting that we need to eat our vegetables first. We look for the promotion, the corner office and the pay rise, without first putting in the hours and getting the results that earn it. We want the chiseled physique and the wardrobe to show it off, without eating sensibly and spending time in the gym. We want the perfect, well-behaved kids, without consistently reinforcing required standards of behaviour from a young age. Basically, we want the achievements (and all of the accolades that come with them), without the years of anonymous, unnoticed grunt work. 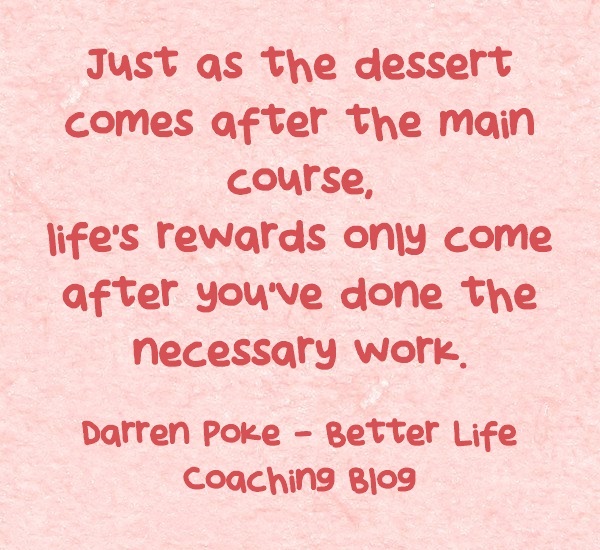 Just as the dessert comes after the main course, life’s rewards only come after you’ve done the necessary work. But once you’ve done the work… dig in! Next post – Are You Tricking or Treating Yourself? Rewards come only after the hard work…never before…Two thumbs up! !